Instructions for growing grass generally mention the importance of good drainage for healthy growth. For the most part, good drainage is fundamental to having a healthy lawn, and most of the commonly planted lawn grasses are intolerant of poor drainage. But some grasses can tolerate constant moisture better than others, and there are a handful of lesser-known varieties that can grow -- and even thrive -- in wet soils. 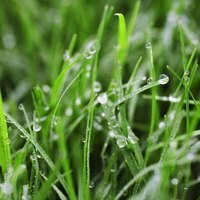 Tall fescue (Festuca arundinacea) is a popular and widely adapted lawn grass that has better tolerance of poor drainage than most other varieties. This does not mean it will tolerate standing water on a regular basis but can give a good lawn cover in moist soils. Tall fescue is a coarse-textured grass that grows in full sun or part shade in U.S. Department of Agriculture plant hardiness zones 4 through 7. Fescue lawns looks best in cool weather and stay green through the winter in the milder parts of their range. Carpetgrass (Axoponus affinis) is native to the Gulf Coast region and thrives in constantly moist soil. It is hardy in USDA zones 8 and 9 and is commonly planted as a lawn grass in the southeastern United States. Within this climate range it is highly adaptable, tolerating sun, partial shade, low fertility and acidic soil. Carpetgrass stays green year-round but has unsightly seed heads that appear if not mowed every five days. Creeping bentgrass (Agrostis stolonifera) tolerates a wide range of soil types, including wet, poorly drained soils, and can even tolerate occasional flooding. It is hardy in USDA zones 4 through 6, preferring cool, humid climates. Creeping bentgrass is considered a high-maintenance lawn grass, requiring very specific mowing and fertilizer regimes. It has large, aggressively creeping rhizomes and can easily outcompete other grasses or invade areas where it was not intentionally planted. Though not commonly planted as a lawn grass, reed canary grass (Phalaris arundinaera) is tolerant of truly boggy conditions and is often used as a ground cover along waterways and wetlands. It is hardy in USDA zone 4 to 9 and can be quite invasive in wet areas, but is more restrained in clay than in sandy soils. Reed canary grass grows best in light shade and has a tidy clumping habit and ornamental seed stalks to 5 feet in height. The foliage is striped with white and there are several ornamental cultivars available with pink, burgundy and yellow coloration.